Are you looking to enhance the look and feel of your house lawn? Perhaps you are owner of a commercial property and want to enhance the curb appeal. No matter what your landscaping ideas are, it is always recommended to hire professional landscaping services in Gold Coast when you want the best-looking final product. PB Earthworks is well equipped to turn your landscaping dreams into reality. Professional landscaping helps to register a positive first impression of your property, enhances the curb appeal and also adds to the value of your property. When taking on a landscaping project, you will need to plan out things perfectly and most importantly you will have to know where to start. Trying to plan your landscaping project without professional assistance could turn out to be a daunting task. You might feel that something will look brilliant in your lawn but making it a reality can be easier said that done. Professional landscaping companies have a team of highly experienced designers and landscapers who examine your land, figure out what is feasible, and identify problems before providing you with the best solutions. Once you hire a professional landscaping company, you can get the work done within your budget. When you hire professional landscaping services in Gold Coast, it is very important that you discuss your budget in detail. A professional landscaper can always find a landscape design within your budget. 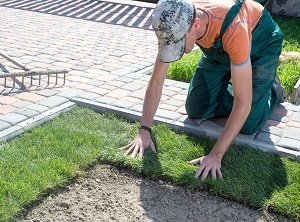 After you discuss your budget, professional landscapers will not only determine the best options available for you but also help you make the right decision. Professional landscapers use the best techniques and methods to get the work done in the shortest amount of time. When you hire professional landscaping services, you can heave peace of mind knowing that the work will be completed within the quoted time. With decades of experience in the industry, professional landscapers are fully trained and well equipped to deliver the best results. They keep up to date with the latest styles, trends and technologies in a bid to complete landscaping projects of all sizes with the utmost precision and care. Professional landscaping companies use high-end equipment, best tools, top-notch materials and high safety standards to deliver amazing results at the end of the day. When you hire a professional landscaping company, you can save a lot of time and money. You don’t have to splurge the cash on buying equipment for landscaping neither do you have to take time out of your busy day-to-day schedule for completing the work. The above-mentioned benefits make it very clear why you should hire professional landscaping services in Gold Coast. At PB Earthworks, we have decades of experience in providing stylish, durable and affordable landscaping services to both residential and commercial establishments. No matter what your landscaping dreams are, we can turn them into reality.